In case you have to make a run for it, LOL. 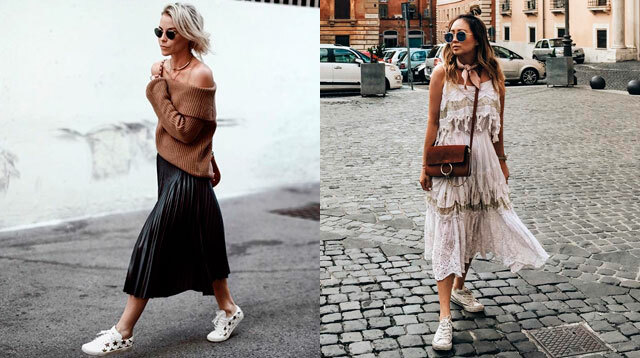 Combine silk and lace details with sneakers for a flirty-cool feel. Exude a cool '90s vibe in a velvet slip dress worn over a white tee. Playful rompers are just about the easiest thing to wear! You can’t get more date-worthy than an embroidered white dress. Brighten up classic separates with pretty pastel colors. Dress down a side-slit silk dress with your trusty trainers. Spruce up denim and sneakers with a ruffled top. Swap high heels for sneakers to temper a body-con dress. Loosely tuck an off-shoulder sweater into a pleated midi skirt. Balance the sweetness of a lace dress with cool girl accessories.